The garden has started to take a bit more form this season. 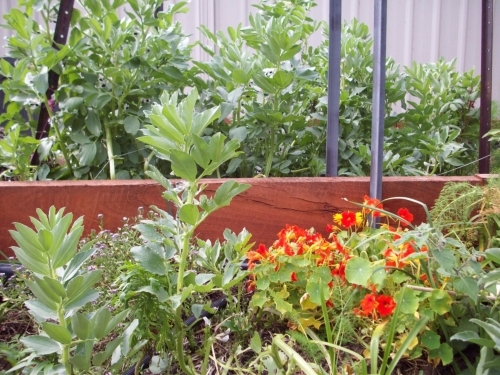 In the early days it was a couple of plants placed in specific areas with everything else filling in between. Now that the mallees have been removed and the garden is receiving so much more sunlight year round than it use to, I have been able to see how this affects the plants. 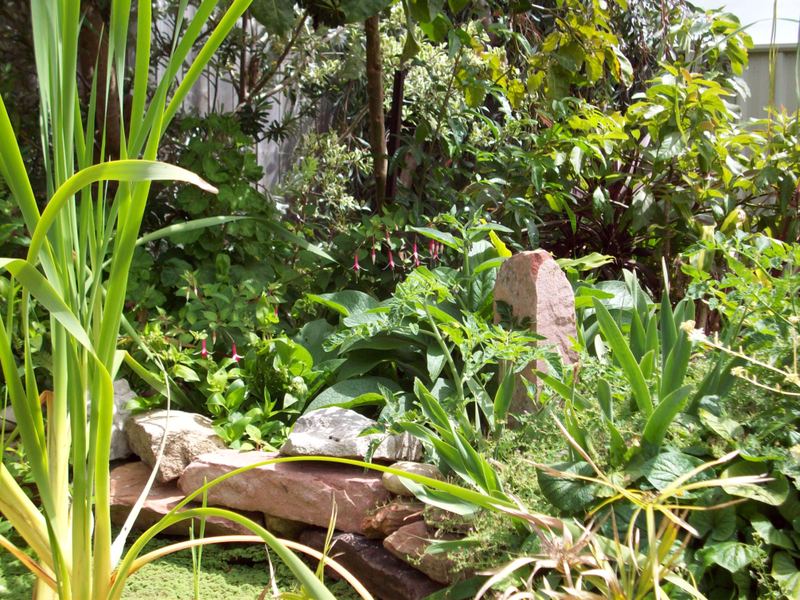 Various areas of the garden have been broken up into groups to make things a little simpler. For instance the picture above shows the lower corner of the garden. Here I have planted orphaned plants that have come our way or needed moving from the other garden beds. It really functions as a final catchment for water running off the block and as a little forage corner for the chickens at various times. 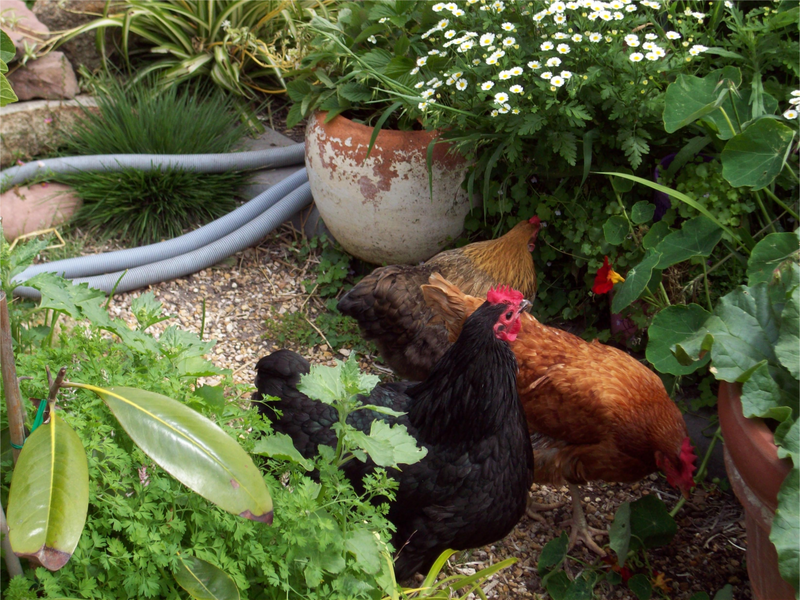 Here the chickens are foraging at the edge of the Hedge Garden that borders the main garden bed recently built. This area is mainly herbs and bee attracting flowers. The Cape Gooseberry is taking up a substantial part of it at the moment and may later get moved, or cuttings moved to the corner garden and the main bush trimmed back. The guinea pigs like to forage along this border as well and given they largely eat their greens from the garden (they are totally free-range) they need to be able to access little areas for food without interfering too much with any crops – like broad beans! This little pond is a recent edition to the garden and fills from the strawberry garden (aquaponics) to flow into the main pond where water cycles back through the strawberries and repeats its cycle. 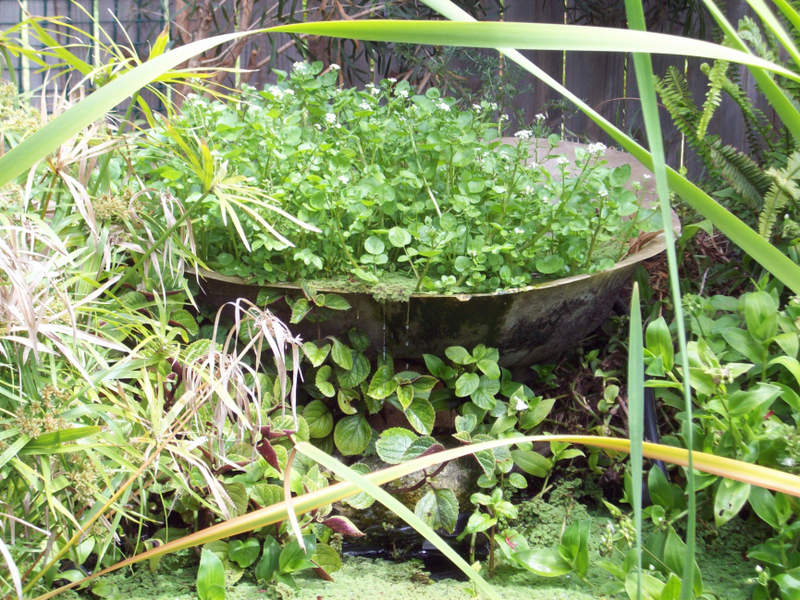 This pond is currently home to a large area of watercress which I think is a terrific thing to have in the garden. More of the Hedge Garden with nasturtiums, broad beans that the guinea pigs have permission to eat, bulb flowers, coastal daisy, rosemary, marigold, allysum and fennel to name a few. Behind the garden bed wall is the main bed that will function as a vegetable garden with corn, tomatoes, potatoes and whatever else I fancy. At the moment there is purple broccoli and a metre or so of sunflowers to feed the chickens and create some privacy for the back neighbours.